I had an integration test that was very complex (most are, sadly) and took too long to start. 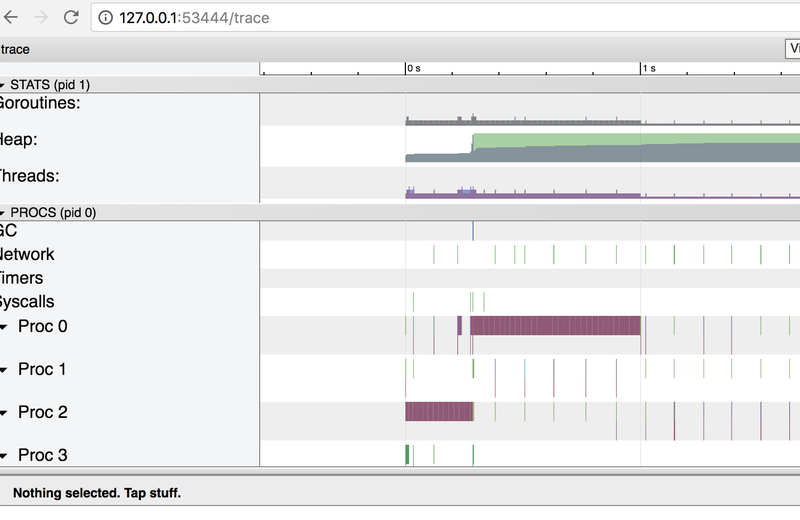 I was able to diagnose why using new features of Go’s 1.10 trace tool. This post describes my workflow and what led me there. The example code I’m using for this post is at https://github.com/cep21/trace-110. My integration test was a bit more complex, but generally had startup that was slow due to a single goroutine out of many that did lots of different things. In this example, takeIO is similar to the “startup” part of my integration test. My first thought was to generate a CPU profile. Unfortunately, this shows CPU usage when my integration test was hanging somewhere due to network usage. I tried looking at the profile in a web UI to see if that would help: it didn’t. Main binary filename not available. The old solution was to compile the test binary first, but with go 1.10 I don’t need to do this! Closer, but still a bit too noisy for my real code. 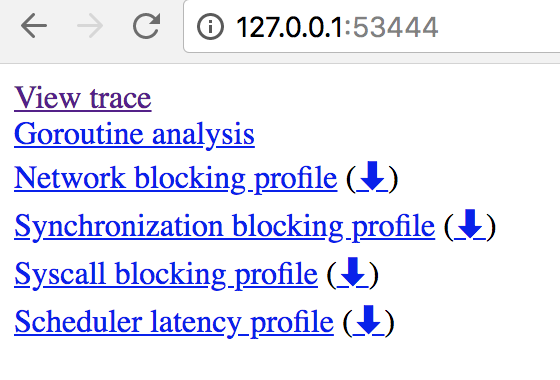 Go’s trace tool is what I need here. It has the level of detail I need, limiting my profiles to specific goroutines. Now let’s view the trace output. Information overload! This is a fun UI, but honestly isn’t very helpful so far. I have a hunch that it’s networking related, so let’s click the Network blocking profile button above. In my actual app, this was way too much noise. My integration test was doing a large number of networking calls, when it was startup time I wanted to optimize. I know the specific goroutine that starts up my server. 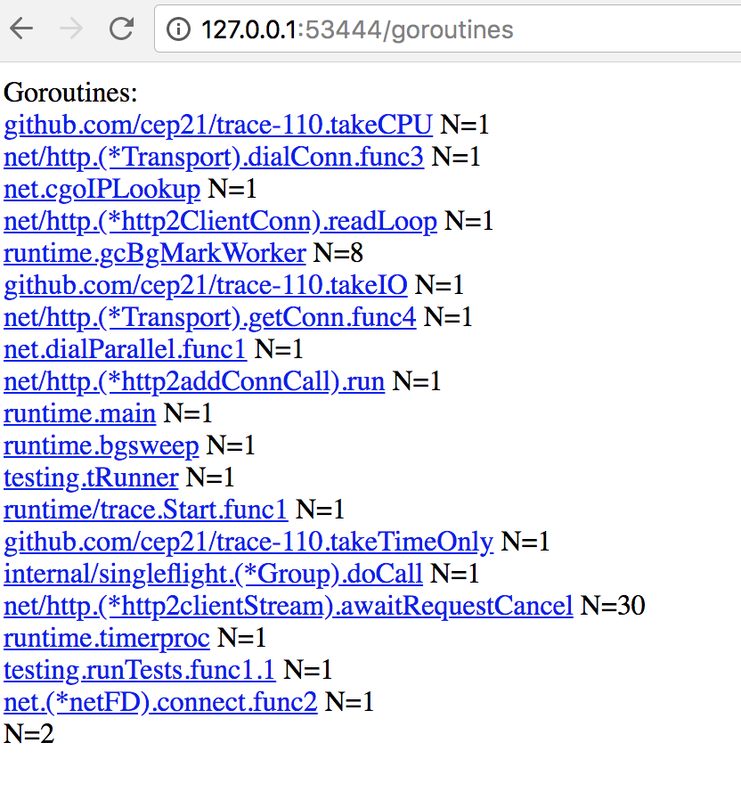 Let’s load just that for the trace by clicking the goroutines button. Notice they are clickable. I knew the name of my integration test goroutine, so I go there. It is the “takeIO” function for this example code. For this goroutine, the execution time is small because it doesn’t do much. But the total time is large, since it’s waiting on IO most of the time. From here, I had all I needed to find the stack trace that was causing the slow startup time. This was enough for my use case, but I want more. Notice the blue down arrow on the goroutine page. I can click that to download a pprof usable profile. Rather than download it, I can reference it directly from the CLI. I can explore this just like normal pprof profiles. Top cumulative shows me the stacks that block the most for that goroutine. I wanted to share this with coworkers, so I created a flamegraph. 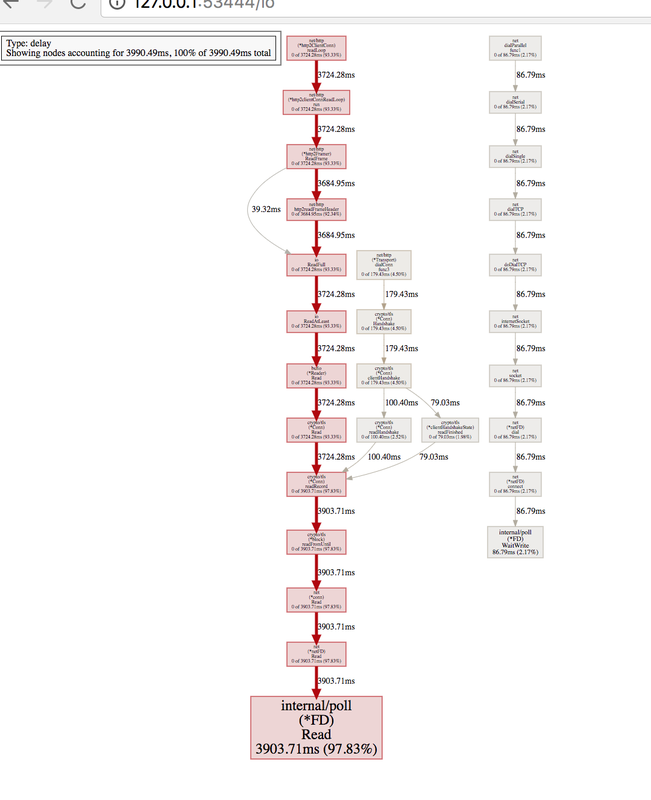 Flamegraphs are great ways to visualize complex stacks. Unfortunately, I need to use the original pprof for this. I can now load up the profile using this pprof, not the one with Go. Notice no go tool at the front of the command. 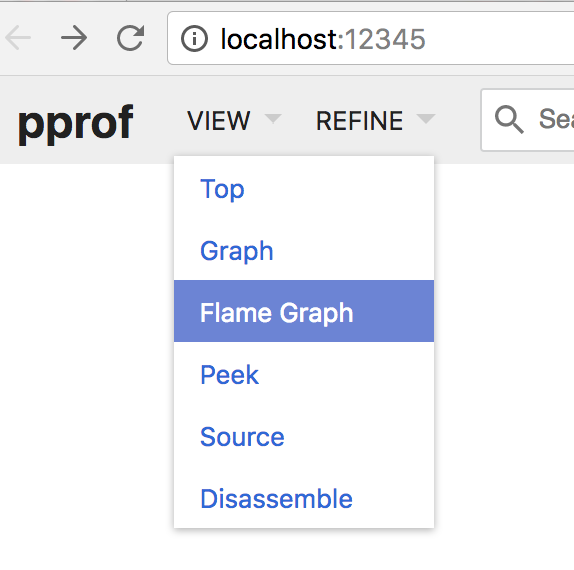 This flamegraph seems obvious for my toy example, but my real code’s stack trace was very complex and this was able to help tremendously.